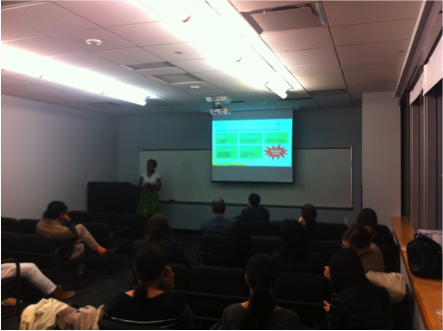 On April 24th Zicklin Women in Business (ZWIB) cosponsored a social entrepreneurship event with the Sustainable Business Club and the MBA Association (MBAA) at Baruch College. 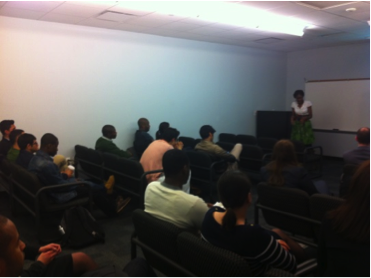 We welcomed Misan Rewane, an MBA student at Harvard Business School (HBS) and co-founder of Designing Futures and WAVE (West Africa Vocational Education), to speak about how education in Africa can be improved by social entrepreneurship projects. Born and raised in Nigeria, Misan knows firsthand how hard it is to receive a good education in West Africa. After studying and gaining valuable management and policy consulting experience in the US and the UK, Misan was keen to develop entrepreneurial solutions that address education challenges that affect Africa’s most disadvantaged. While working with classmates at HBS to develop a vocational education model to train low-income West African youth in critical skills and place them in paid apprenticeships, Misan joined Sola Adeola in launching Designing Futures, an incubator focused on supporting entrepreneurs working on innovative solutions to challenges of access and quality along the education value chain from early childhood to post-secondary education. About Zicklin Women in Business (ZWIB): ZWIB is a professional organization that provides career, networking and mentoring opportunities for women and men at Baruch’s Zicklin School of Business. Our goal is to create a rewarding long term network for our community. We actively connect our 400+ members with distinguished alumni and professionals. We host discussions on important topics such as successful negotiation techniques, the use of emotional intelligence, and the breaking of the corporate glass ceiling.